It’s that time of year when we all tend to become more introspective. We’re surrounded by talk of weight loss, exercise programs, and job searches. We vow to get organized, save more, reprioritize, and generally become better people. I don’t know about all of that, but I am doing a lot of looking back at the past year and I do have a few thoughts about 2009. This year, I’ve written 24 posts (You’re reading #25!). I’ve shared the good, the bad, and the ugly. For 2009, I hope to concentrate more on the process of what I do, from quilting to writing to web design to teaching and lecturing. I welcome your comments. 2008 has been a great publishing year for me. Machine Quilting Unlimited has published my articles and given me a column. I’ve written for Quilter’s Home and one of my quilts appeared in the Washingtonian magazine. My studio was featured in the Professional Quilter magazine, and I had a quilt and a tip included in Ann Hazelwood’s book 100 Tips from Award-Winning Quilters. 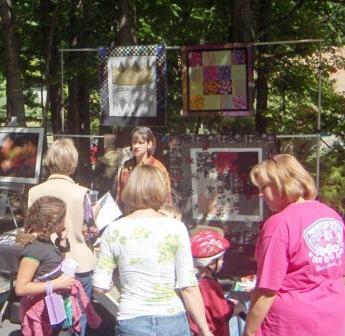 For 2009, I’d like to branch out to e-books about art quilting and other quilt-related topics. Let me know if you have any topics you’d like me to write about. It feels like I’ve spent most of 2008 making quilts for everyone but me. I’ve been in a number of challenges and I’ve made lots of quilts that conform to someone else’s rules. Don’t misunderstand; I love the quilts that have resulted, but I’m ready to explore some new territory. In 2009, I’d like to produce some smaller work. These pieces will give me the chance to experiment with some new techniques, play with some new ideas, and offer some new work for sale. Watch the “Quilts for Sale” page on my website for available pieces. 2008 started out with a bang when I was fortunate enough to be nominated for the Professional Quilter magazine’s Teacher of the Year. What an honor! Locally, I have really enjoyed teaching Art Quilting at the Quilt Patch this year. I love to travel to lecture and do workshops for all kinds of quilt guilds. In fact, I lectured for SAQA in Houston again this year. 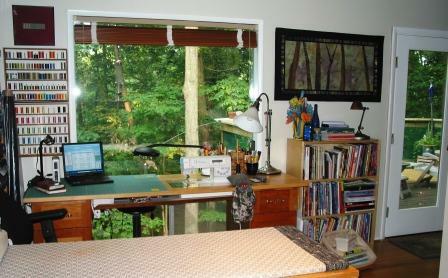 For 2009, I’m starting a new section of Art Quilts 101 and I plan to continue the current Art Quilt sections. Be sure to watch for new Toolbox classes. In addition, I’m currently booking travel for 2009 and 2010. Maybe I’ll see you out there in the Quilt world. Check my web calendar to see if I’ll be in your area or to check availability for your guild. I hereby acknowledge that I am becoming a web weenie. (Hmm. Maybe there’s a better title than that out there.) Anyone who knows me knows that I keep my computer close at hand and the thought of no Internet access can induce hives. And so I have embraced my inner geek and I plan to expand the web design part of my business beyond the four websites I already maintain. I am upgrading my software and I’m learning all I can about online commerce. I’ll include updates in future blog posts. As I read this, I realize that I’ve set some monster goals for myself. I can feel my to-do lists growing even as I type this on the way home from visiting family. (Yes, we’re on I-95. No, I’m not driving.) I don’t know if I can accomplish everything I’ve set out to do, but I can guarantee one thing: I will not be bored. I invite you to take this ride with me. I’ll try not to bore you either. I live in an amazing neighborhood. My neighbors are wonderful, the houses are cool, and the sense of community is something I’ve never experienced before. Yesterday, we celebrated the artists in our community by reviving a Truro tradition called “Art in the Park.” For two hours, we invited people from the ‘hood to browse our booths and buy or just introduce themselves. I am in awe of the talent in our little corner of the world. We had painters, jewelers, photographers, fiber artists, mixed media artists, art suppliers, and even someone who was selling coffee! Of course, we had enterprising youngsters with lemonade, hot cider, and brownies, and we had a booth with entertainment for the kids. The weather was glorious and the everyone seemed cheerful. Does anyone else do this? I can be quite productive when I’m avoiding something. Here’s how it works. I make a list of everything that needs to be done. If I’ve already done something, I add it to the list so that I can cross it off. Then I search for…no, not the highest priority; I search for the task that I would least hate to do. Sometimes it’s laundry, dishes, cleaning the studio. Right now, my studio’s in pretty good shape, thanks to avoidance. Thank goodness I can sometimes escape the avoidance trap. When the planets are aligned, the dog is calm, and all is right with my world, I can sometimes sit down to that daunting, scary task that I’ve been most avoiding. Today, I started a commission that I’ve been putting off. It scares me a little. I have the vision, but I really, really want to nail this one. I’ve set the bar high and now I have to produce. Once I have something to show, I will. Oh, and I finally started my blog. Now what we’ve met, I hope we see a lot of each other. The Queen of Avoidance is a long name; you can call me Cyndi.